Richarlison has credited Marco Silva's coaching with accelerating his progress this season as he looks to take his Everton form onto the international stage with Brazil. He goes into Brazil's friendly matches against Panama and Czech Republic having scored in Everton's last two games, and is grateful for the support of his club coach. 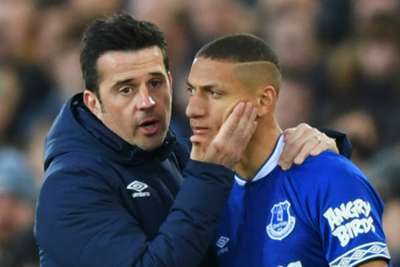 "Marco Silva is always talking to me in training, he is always giving me guidance on positioning in the area," Richarlison told Everton's official website. "I feel I have been developing more and more. I want to show I can play at my best for a whole Premier League season. I feel really good at Everton. My team-mates are helping me with my confidence on the field and that is vital. "And being part of the Brazil national team has been really important for my morale and a positive thing for my confidence." | Scenes in the Street End, Yerry Mina's back-slide...! Richarlison said he understood why Silva opted to utilise him from the substitutes' bench in Everton's recent games against Manchester City and Liverpool, before he was restored to the starting line-up against Newcastle United and Chelsea. Silva's men are 11th in the table after losing only one of their last four matches, and Richarlison said rotation was important to the club's hopes of finishing in the top half. "It is an incredibly intense season, right from the start, and he [Silva] needed to protect me a bit," said Richarlison, reflecting on his time outside the starting XI. "I understood that completely. My team-mates also have to be given a chance. "But I will always work really hard in the week and hope it ends with me with me playing in the team."